1. Duleek. General View of Cross Shaft. North Cross. East Face. 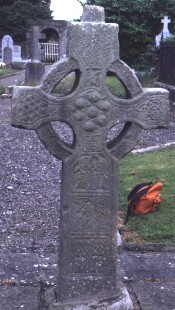 This sandstone cross is situated in a cemetry at the North of the Protestant Church at Duleek. Its measurements are 1.82 high x 97 cm arms span, the shaft is 37 cm wide by 21 cm. It is mounted on a (visible) base 50c m x 45 cm. Each panel is framed by a roll moulding. This is a general view of the East Face of the North Cross at Duleek, Co. Meath. Crawford, H.S., , ‘A Descriptive list of Early Irish High Crosses’. In Journal of the Royal Society of Antiquaries of Ireland (1907) 37, 187-239. Crawford, H.S., , ‘Supplementary List of Early Irish Crosses’. In Journal of the Royal Society of Antiquaries of Ireland (1918) 48, 174-179. Crawford, H.S., Handbook of Carved Ornament from Irish Monuments of the Christian Period 1st, , Dublin (1926) . Crawford, H.S., , ‘The Early Crosses of East and West Meath, County Meath’. In Journal of the Royal Society of Antiquaries of Ireland (1926) 56, 1-10, 71-81. Gsanger, H., Irland, Insel des abel. Die Irischen Hochkreuz 1st, , Freiburg i. Br. (1972) . Henry, F., La Sculpture Irlandaise pendant les douze premiers siecles de l'ere Chrétienne 1st, , Paris (1933) . Stokes, M., The High Crosses of Castledermot and Durrow 1st, , Dublin (1898) . Streit, J., Sonne und Kreuz. Irland zwischen megalithkultur und fruhem Christentum 1st, , Stuttgart (1977) . Visser, G., Voskuilen, A., Zandstra, W., Die Ierse kruisiginsikonografie van de 7de tot de 13de eeuw. I Tekst; II Catalogus 1st, , Utrecht (1981) .